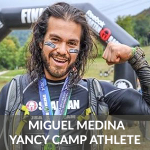 Premier OCR Athlete Miguel Medina - Yancy Camp - Fitness for Everyone! Known for having amazing range in the sport with numerous podium finishes in the stadium races as well as extreme endurance events like World's Toughest Mudder & Spartan Death Race. You can spot Miguel competing at Spartan (Sprint, Stadium Sprint, Super, Beast, Ultra Beast, Death Race, & Agoge), BattleFrog, Fuego y Agua ultra endurance race, World’s Toughest Mudder (closed out the 2014 season as a member of the World’s Toughest Mudder Championship Team that covered 75+ miles), OCRWC, and other ultra endurance races. Miguel is known as having great range and is competitive at the shortest and longest races our sport has to offer. 2015 Season: Numerous podium finishes and highlighted his year at Spartan World Championships with a 2nd place finish in the Ultra Beast. Miguel is excited to partner and train with clients from all over the world who are ready to join his #YancyCamp Training Program. *Contact Miguel for great discounts from all sponsors.